So we picked this bike up the other month for short change. I just recently moved into a new shop and dug all my old bikes and projects out and unearthed my old velorex 562. I've always wanted a hack and and the 562 looked just too nice sitting next to the brick so I decided to marry them. I took plenty of measurements and fabbed up a subframe and am finalizing the welds and work necessary to get the bike road worthy. I set the wheel lead to 10"s, plan to off set the bike about 1*, and haven't figured out toe yet but I'm thinking to start around .75". Does anyone have any recomenations? I also ditched most of the velorex mounts and made proper solid ones that won't move on me. Lean out and toe really cannot be fine tuned until you get it on the road. 1 - 2 degrees lean out and 1/2 or 3/4 inch toe in should be good starting points. The Velorex really looks nice on that S.
Thanks Chaos. I'm glad it sounds like I'm starting in the right direction. Do you have a chair on your k75? Long time ago I had a flexit on the K, but that's a totally different animal. 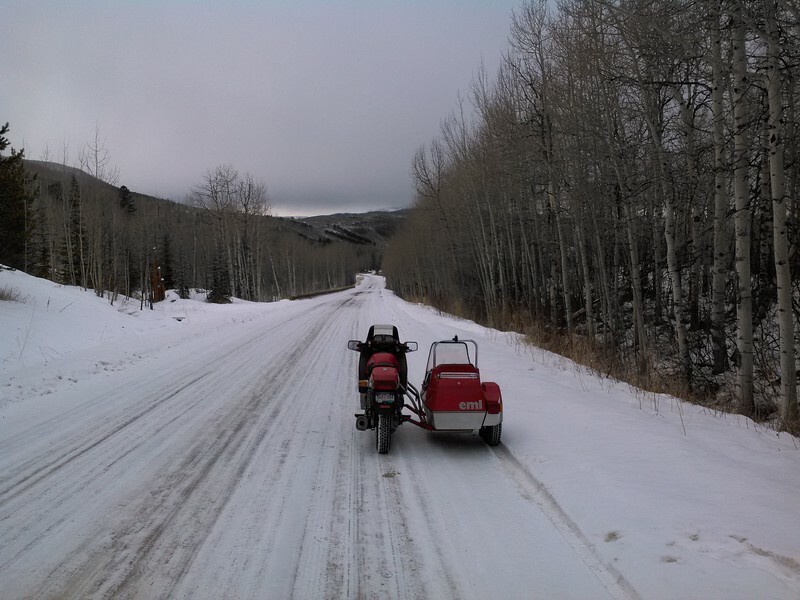 Last 5 years I've been learning sidecar trivia with a Ural. That's is one heck of a wonky animal! I saw one a few years back parked and tried to find the owner but had no luck. How did that thing handle?! The flexit handled pretty much like a 2 wheeler, just heavier. Neat design, the sliding canopy was great for keeping the dog in the car. Lot speeds it felt good, I'm looking forward to getting it on the road to dial in. Looks good, nice to see another hack'd brick. Thanks! Is that an rt or an rs? I'm contemplating switching over to rs fairings with rt bars. Did you happen to switch to a car rim or tire in the rear? This bike needs new shoes and I'm unsure what to do for now. Mine is actually a factory EML build and it is a 1985 K100RS. It has the EML frame for the drivetrain and EML wheels with 135r15 tires. Your rig is looking pretty nice. That black K75S looks so-o-o right with that sidecar. Thanks Gryph! I wish my bike had the black casings too, but beggers can't be choosers. Dirty, that is a gorgeous and serious outfit you've got. 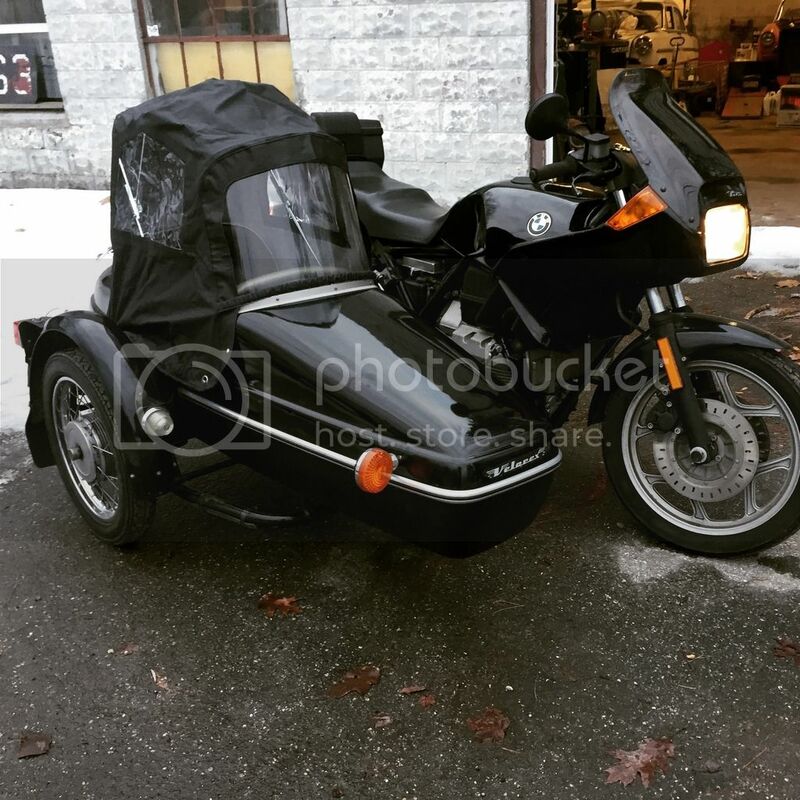 I always wanted a sidecar outfit and this entire deal fell into my lap in bits and pieces so I'm going to give a go and figure it out over the summer. I assume I'll end up making some changes to the velorex suspension, and if I enjoy it enough I'll build a leading link for it next winter. Both nice looking outfits, Grendell black cases just a spray pack of paint away. Just so you know the U.S.C.A. sidecar national this year will be in the finger lakes region of New York. You should have it all sorted out by then and it is a good excuse to take a ride and check out a couple hundred other sidecars. I will most likely ride my R11550GS rig out because I am going to run up the North shore of Superior and back up to the Canadian Maritimes for a week or so on my way to the rally. Thanks guys. Dirty I had seen that and was looking for an excuse to go. I'll have to get a spot, do you know if rooms are available? I got some more work done on this thing and finished a drive shaft lube and full fluid flush. I had to drop the oil pan. Some gorilla cranked filter on so hard it took removing the pickup tube a sneaking in giant set of channel locks and a prayer to get it off. I'm ordering tires in the next week or two, does anyone have suggestions for something that fits the early y-spokes with a disc in the rear? After a season under my belt I’m making a few changes. I bought a mint k11lt I was going to put a chair on but the 75s is special to me for some reason. So I’ve decided to make it more of what I want and picked up a leading link front end, car rear tire conversion, and a bunch of turbo bits. I spent a large part of the summer figuring out what luftmeister did and can safely say I know how to replicate their kit, I will be using a smaller ball bearing turbo from a 1.0 fiesta so I hope to have a lower torque curve. My goal is to make as close to k100 power as possible with the 750. I swapped out the front end yesterday to the unit forks which will make long trips much more comfortable. I’m waiting for k11 Brembo calipers to show up and will either make it work with the original k75 wheel for now or upgrade to the k11 wheel too. I really like how the bike is beginning to look as a dedicated sidecar assembly. Most of the turbo bits are ordered and here/ en route. 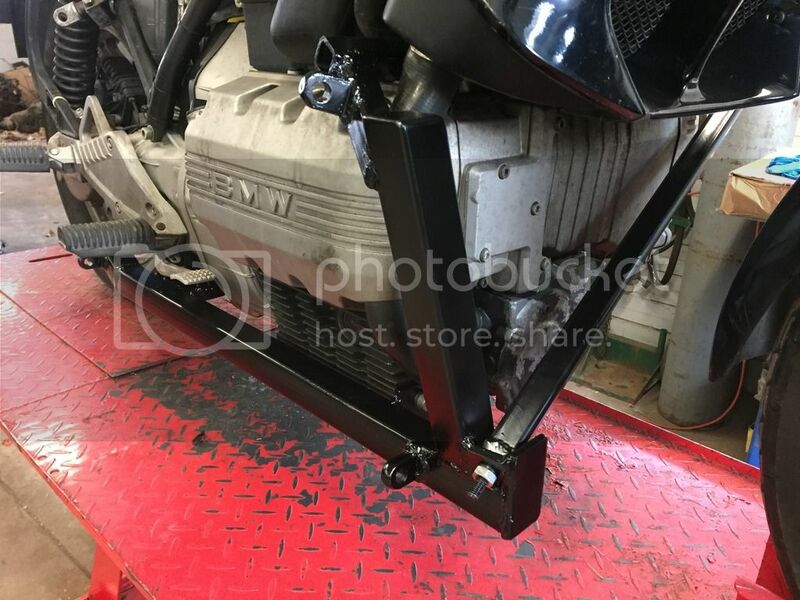 I am pleased to say I can sneak the tiny snail in between the engine and leading link fork just underneath my subframe. I was hoping to run an internal wastegate but I had to remove it to make room and re-clock the compressor housing into a better position. My spare ebay extra exhaust manifold showed up so once I get my oil pan back from a buddy tig welding the return line fitting I’ll be making the turbo manifold. 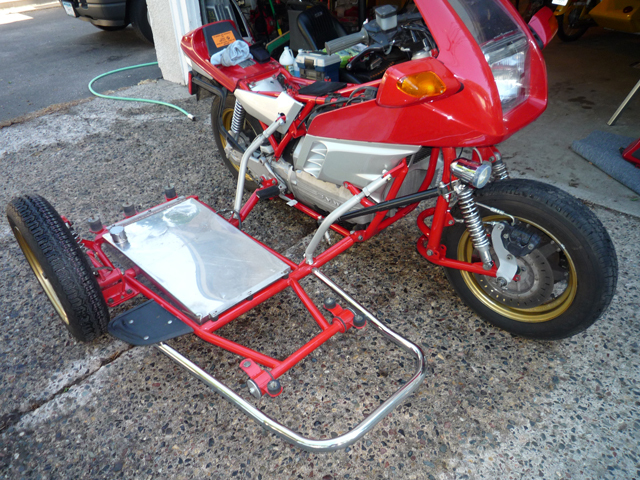 I also have a rear wheel adapter being modified to accept a4x100 rim I will install and have a matching sidecar wheel, but that project will have to wait until after the turbo when I have time build a new frame for the velorex. It will have adjustable caster/camber and on the fly leveling with a dual caliper brake setup. So far I have all the piping and oil feed lines planned just need to execute it all and figure out the coolant lines to the turbo and make up my mind on air/air ic or air to water. Since photobuket is holding my images hostage I’ll re-document and try to upload here. The front end is installed and ready to go. I also had some time today to work on the turbo manifold.I am reusing the factory manifold and am quite impressed with how easy it will be to make this work! I cut off the front cylinder tube and was able to completely flip the manifold around. I will keep the front cylinder pipe in its original location facing backwards and loop it forward to keep header tubes equal length. The oil pan and turbo is off at the machine shop getting mocked up for the new return line. I also needed to have some turbine in that and exhaust flanges made since they aren’t available on the market as well. I can’t wait to get the turbo and pan back next week to finish the exhaust and move onto the charge pipe and fluid lines. 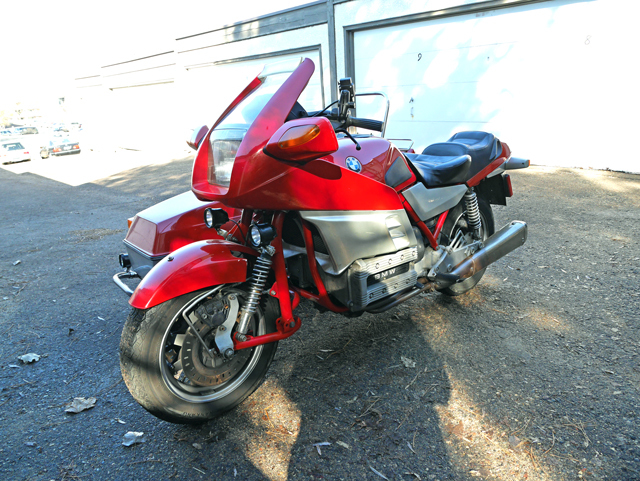 I just swapped for a DMG sidecar mount here on MB...Your last post was Valentines Day 2018? Maybe things did not go well for the sidecar project after that? 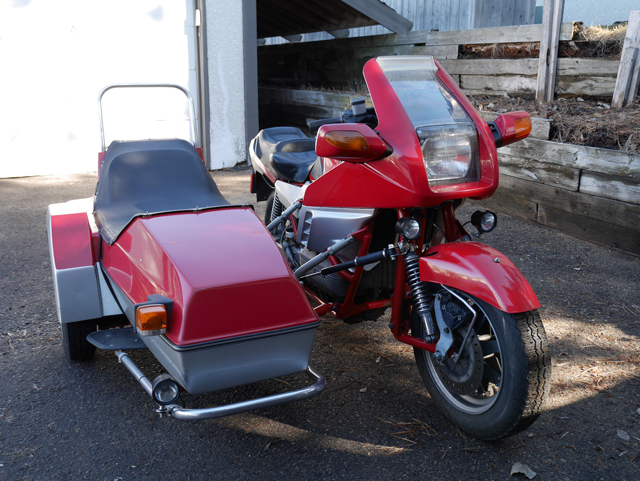 Serious, I'd love to learn how the customizations went as I contemplate whether to purchase or fabricate a sidecar. Livingston, SW WI. USA-"With the good earth all around." The slice of the white car on the right...Austin Healey? Fiat 500. Attached is a photo of a '63 indicating similarities.